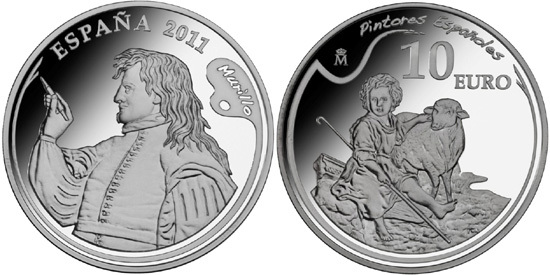 The Real Casa de la Moneda (Royal Spanish Mint) have issued (11th July) five coins dedicated to some of the Country’s most well-known and celebrated Spanish painters. This is an on-going series and these five coins represent the 4th installment. The set includes one gold coin and four silver, one of the coins being a 73 mm silver proof strike weighing 168 grams. The coins in this issue highlight Domenicos Theotocopoulos, or “El Greco” (1541-1614), Bartolomé Esteban Murillo (1617-1682), José de Ribera, or “Lo Espagnoletto” (1591-1652) and Francisco de Zurbarán (1598-1664). The five coins in this set feature some of the artists’ oil paintings most representative of their work. The coins are struck in proof quality and are expertly engraved to show the smallest detail of the original paintings featured. 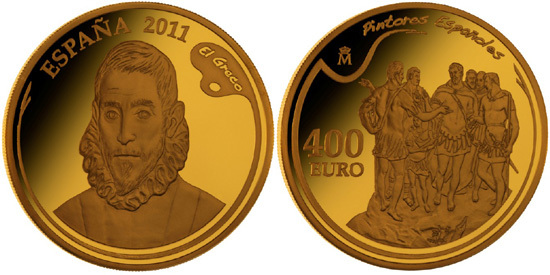 The €400 gold coin. El Greco. This coin, with a traditional denomination of 8-escudos, depicts on the obverse El Greco’s painting “Aged Nobleman”, housed in the Prado Museum in Madrid. The reverse portrays a detail from El Greco’s painting “The Martyrdom of St. Maurice”, housed in the Real Monasterio de San Lorenzo de El Escorial. Struck in .999 fine gold, the coin has a weight of 27 grams and a diameter of 38 mm. The total mintage is 3,000 pieces. The €50 silver coin. El Greco. The coin, with a denomination equivalent to the traditional “Cincuentín” features on the obverse a detail from the upper part of El Greco’s painting “Burial of the Conde de Orgaz”, housed in the Church of Santo Tomé in Toledo. The reverse shows the detail from the lower portion of the same work. This coin is struck in sterling silver (.925) and weighs 168.7 grams with a diameter of 73 mm and limited to 5,000 pieces. The €10 silver coin. Murillo. The coin, with a denomination of 8-reales, depicts a rendering of Bartolomé Esteban Murillo based on the medallion carved by the sculptor Ramón Barba (1767-1831) that graces the façade of the Prado Museum building in Madrid. The reverse features Bartolomé Esteban Murillo’s painting “The Good Shepherd”, housed in the Prado Museum in Madrid. 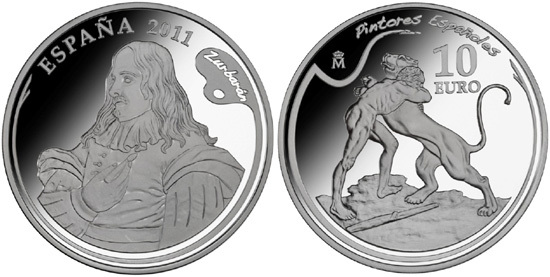 This coin is struck in sterling silver (.925) and weighs 27 grams with a diameter of 40 mm and limited to 10,000 pieces. The €10 silver coin. Ribera. The coin, with a denomination of 8-reales, depicts a rendering of José de Ribera based on the medallion carved by the sculptor Ramón Barba (1767-1831) which also graces the façade of the Prado Museum building in Madrid. The reverse features José de Ribera’s painting “Jacob’s Dream”, housed in the Prado Museum in Madrid. This coin is struck in sterling silver (.925) and weighs 27 grams with a diameter of 40 mm and limited to 10,000 pieces. The €10 silver coin. Zurbarán. The coin, with a denomination of 8-reales, depicts on the rendering of Francisco de Zurbarán based on one of the medallions carved by the sculptor Ramón Barba (1767-1831) and displayed the façade of the Prado Museum building in Madrid. The reverse reproduces Francisco de Zurbarán’s painting “Hercules Fighting the Nemean Lion”, housed in the Prado Museum in Madrid. 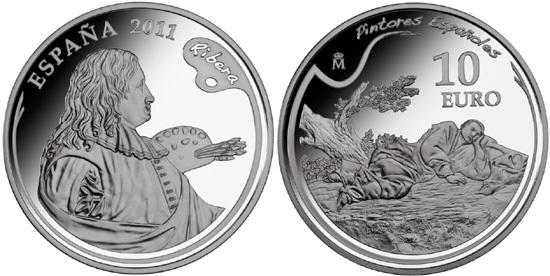 This coin is struck in sterling silver (.925) and weighs 27 grams with a diameter of 40 mm and limited to 10,000 pieces. All coins in this series can be purchased individually or in a five or four coin set. For more information on this and other coins offered by the Casa Real, please visit their website at: http://www.fnmt.es/index.php?cha=collector&scha=14&page=224&spage=495. The information above is currently only in Spanish but there is other information available in English.